There is a pair of Velcro straps built into the phone that would allow it to be tied to something maybe even a telephone pole. There is a 55 pin connector (Digital Data Port (DDP)) that may be for connecting something like a FAX, radio or data device to the terminal and it also may be for connection to an encryption device? The MS27467T17B35S 55-pin circular connector (mates with DSVT data port) might be the mating connector for the TA-1042? There is a KG-84 to UCX-7 Cable that appears to have a connector that mates with the DDP on the TA-1042. 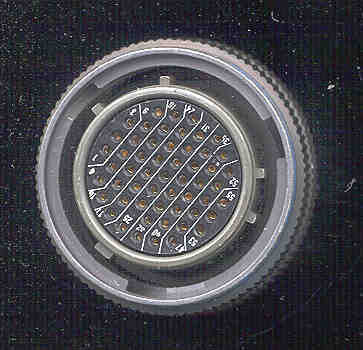 The handset uses a 6 pin U-183 audio connector and may be a version of the H-350. The PTT switch is not used in normal phone operation, only when the phone is connected to a radio. If the PTT switch is pressed when two phones are connected as described below you will hear a beep and when it is released a different frequency beep. The F91100 BER Test Set contains a cable that mates to this connector for testing end ot end BER. Connect the Black PWR binding post on the local phone (total of 2 wires here) to the DC return. The following current numbers are for both phones and a power supply voltage of 20 VDC. With both phones on hook the total current draw is about 10 mA. 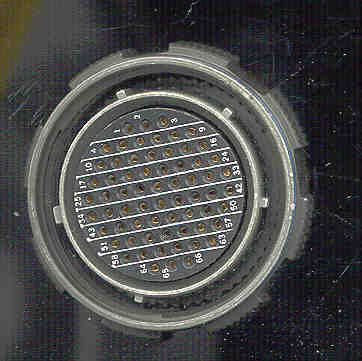 When either phone is taken off hook the other phone rings (its RING LED flashes), the current is about 30 mA. When both phones are off hook the current stays at 30 mA. When one of the phones is put back on hook the other phones RING light will be on steady, indicating that the other party has hung up. When the final phone is put back on hook the RING LED turns off. If the pair connecting to the RCV binding posts is disconnected that phone can still ring the other phone and still hear them, but can not receive anything. This indicates there is no handshaking going on, just straight transmission. The precedence keys (FO, F etc.) have no meaning when only two phones are being used. If the DC voltage is reduced the current increases. This is not what would happen with a resistive load. It indicates that the phone has a switching power supply that will keep the phone going even if the Local Battery is going flat. The digital nonsecure voice terminal (DNVT) is a ruggedized field telephone. It is operable as a tabletop device in tents, shelters, and office environments. It also may be operated outdoors while strapped to a tree or pole. The DNVT is designed for durability to exposure of the elements during operation and transportation. Voice communication is accomplished through the handset. Digital data from an external device interfaces through the TA-1042A/U's digital data port (DDP). The DNVT transmits and receives full duplex, conditioned diphase digital voice and loop signaling information at 16 or 32 kb/s rates. The DNVT is a nonsecure telephone with no encryption capability. It digitizes voice information using continuously variable slope delta (CVSD) modulation. Digital communication transmissions, both to and from the DNVT, are accomplished using a conditioned diphase (CDP) data transmission method. This is accomplished by using the DDP. The DNVT operates in both common battery mode and local battery point-to-point mode, but not simultaneously. The key question is can two of these talk to each other, or can they only be used to talk to a switchboard or phone system? YES, two phones will talk without a switch. Note that the protocol is how the phone interacts with the switch. The MX/FX629 CODEC only converts the voice signals to/from digital using the Continuously Variable Slope Delta (CVSD) algorithm. The TA-954 and/or the TA-1035 phones may only be able to work in conjunction with a digital switch, but a pair of TA-1042 phones can talk to each other. This might be used by the commander as a "hot line" to another important person. Just picking up the phone rings the other party. MSRT Installation Kits for various models of Humvees. Transmit and receive images through the ACUS. Can be used with a DNVT with data port or KY-68/DSVT. How many pins on J1 and what do they do? The TS-21 Blackjack AN/UXC-10 FAX (NSN 5815-01-478-7095) uses the same cable as the AN/UXC-7. General Atronics -part of DRS Technologies - MSE/TRI-TAC DVT/DA - Good description of their phone . . ." uses standard H-350 handset, Continuously Variable Slope Delta (CVSD) modulation (per MIL-STD-188-113) is used to digitize voice at 16 or 32 kbps. This makes the DVT/DA compatible with all other MSE/TRI-TAC telephone terminals such as the KY-68 DSVT, the TA-954 DNVT, the TA-1035 DNVT, the TA-1042 DNVT, the TTA, and the MMT 1500/DNVT Tactical STU III." 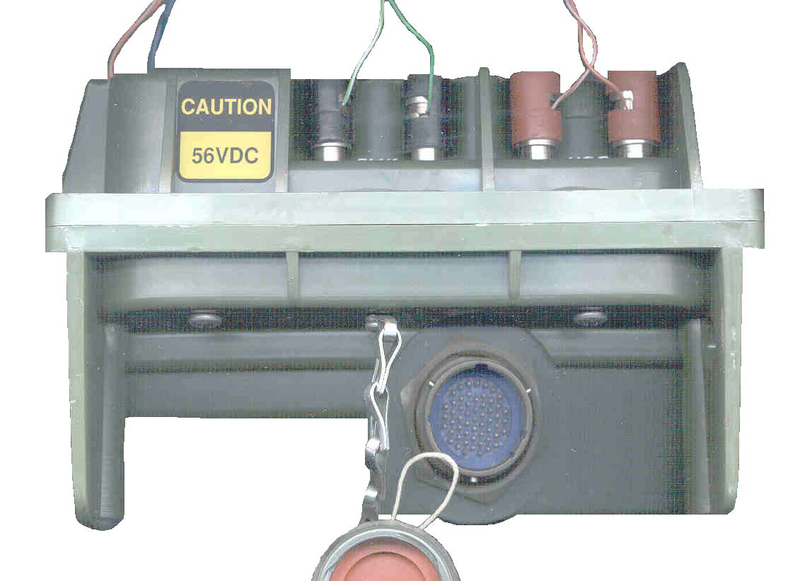 It operates of a standard 48 Volt central office battery with a spec of "Operating Voltage: +20 VDC to +60 VDC"
TA-1035/U Digital Nonsecure Voice Terminal (DNVT) - very similar to the TA-1042, but maybe only 16 and not 32 kbps data rates. 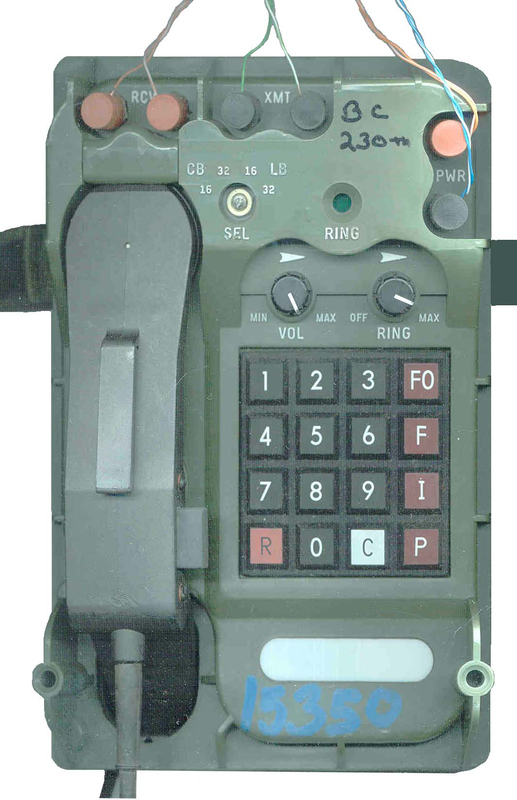 USMC - TOPIC: TA-1042 "Don't throw it away for lack of a handset retaining clip!!!" - USMC has 10,502 of these phones. C-13. The ACUS is the in-theater, tactical communications equivalent to civilian phone service. The ACUS is installed and operated by the Army signal brigades at the EAC and corps levels and organic signal battalions in the divisions’ environment. The ACUS utilizes the MSE communications family of equipment that consists of a variety of multichannel radio and switching systems to form a communications network to provide bulk-encrypted (secure), voice and data, and tactical packet network switching. 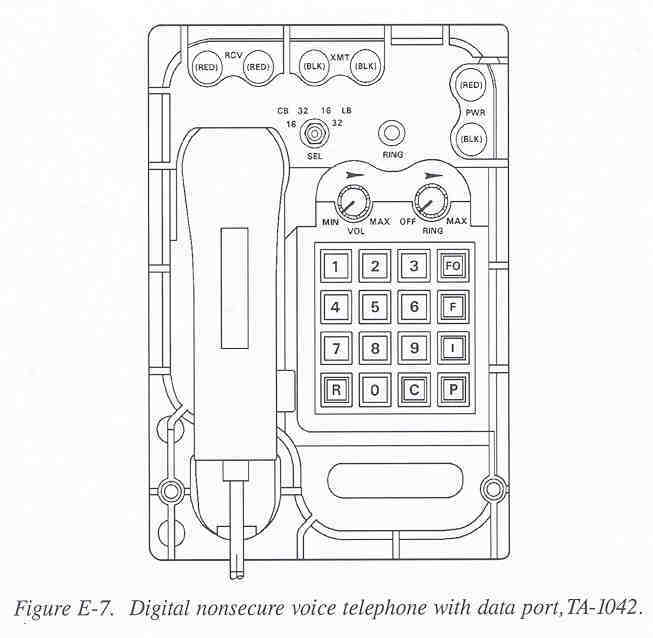 User owned and operated devices that facilitate connectivity to the MSE-ACUS include the TA-1042/U Digital Nonsecure Voice Telephone (DNVT) with data port; the KY-68 Digital Secure Voice Terminal (DSVT) with data port, used for above SECRET and/or special security access transmissions; the AN/UXC-7 lightweight tactical facsimile; and the AN/VRC-97 mobile subscriber radio terminal (MSRT), which provides mobile secure voice into the MSE network. MSE equipment operates at 16 Kbs and is not operationally compatible with EAC TRITAC-ACUS. C-14. At the EAC, the ACUS uses TRITAC equipment. TRITAC is a joint communications family of equipment that uses a variety of multichannel radio and switching systems to form a network that provides bulk-encrypted (secure), voice and data, and tactical packet network message switching. TRITAC user owned and operated devices that facilitate connectivity to the TRITAC-ACUS include the TA-1042/U DNVT with data port; the KY-68 DSVT with data port for above SECRET and/or special security access; the AN/UXC-7 lightweight tactical facsimile; and for a very limited number of subscribers the AN/VRC-97 MSRT, which provides mobile secure-voice into the MSE network. TRITAC equipment operates at both 16 kbs and 32 kbs (selectable) and may be used with both the TRITAC and MSE equipment networks." The J-1077 distrubution box allows for the connection of 13 phones. Green wires to odd numbered pairs and brown wires to even numbered pairs. 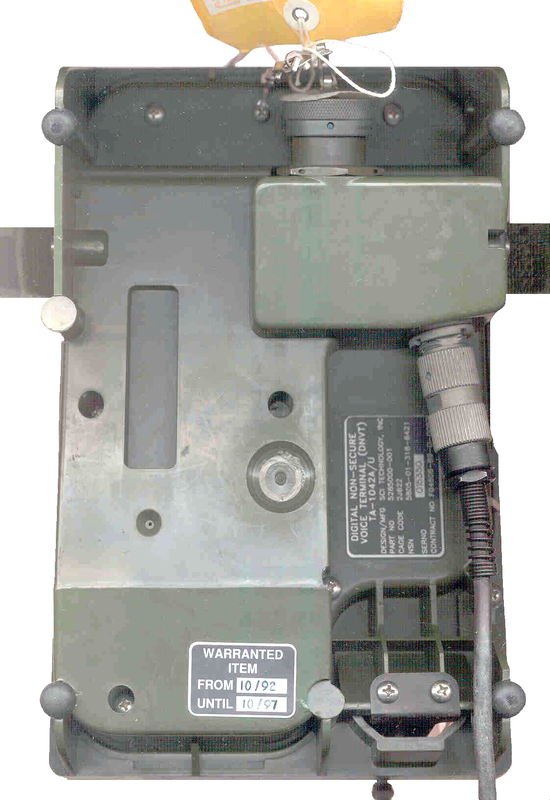 General Information on Tactical Phones (DNVT) - if the field wire is connected with reverse polarity a fuse in the phone will blow requiring DS maintenance to replace. MIL-STD-188-113 Interoperability and Performance Standards for Analog-to-Digital Conversion Techniques. This mil spec is just for the conversion from voice signal to a digital signal, it does not include the signaling protocol for the phones. page created 30 Sep 2001.